And left her to the indifferent stars above. But I think what Sarah’s story tells us is that there were in fact heroes in the Donner Party, and that heroes are sometimes the most ordinary-seeming people. It reminds us that as ordinary as we might be, we can, if we choose, take the harder road, walk forth bravely under the indifferent stars. 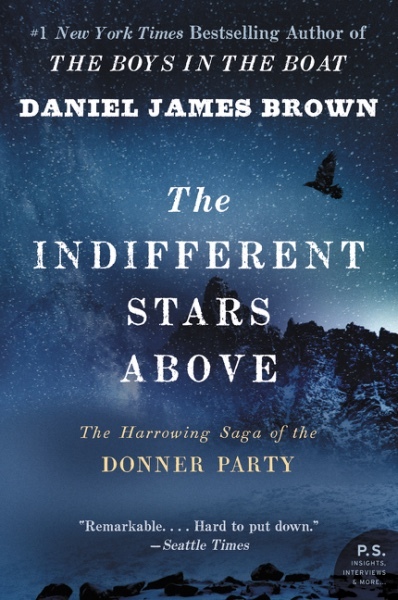 Though we understandably tend to think of it as a story about death and cannibalism, I wanted to approach the Donner Party saga as a survival story. After all, roughly half the people who constituted the Donner Party lived through the ordeal, which means that at the end of the day there were some forty individual survival stories to be told. To my mind, how each survivor managed to sustain his or her life is ultimately more interesting than how the others died. Despite Brown’s emphasis on the courage of the survivors, he is obligated to include many gory details of the lengths to which these people had to go in order to survive. I’m not squeamish, but I found a few sections of The Indifferent Stars Above to be difficult reading. I persevered, however, because all my life I’ve been captivated both by survival stories and the pioneer era. A childhood favorite was Patty Reed’s Doll, narrated by the doll of one of the survivors of the Donner Party tragedy. The doll had nothing to say about the cannibalism surrounding her, mentioning only that Patty cries because she has a stomachache from hunger. 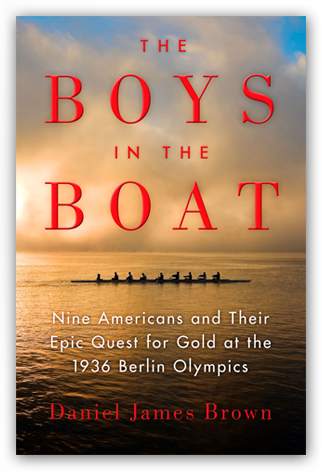 Brown, as you know if you’ve read The Boys in the Boat, is a talented storyteller. In The Indifferent Stars Above, he’s wisely chosen to focus on one member of the Donner Party — 21-year-old Sarah Graves Fosdick. Sarah, her new husband, and the entire Graves family (parents and eight children) set out from Illinois as part of a pioneer wagon train seeking better farming opportunities in California. Brown has a “tenuous connection” to Sarah. His great-uncle, George W. Tucker, journeyed west on the same wagon train with the Graves family: “He had traveled where she traveled . . . his bones had walked the same tedious trails, stretched out at night on the same patches of prairie sod, climbed laboriously through the same icebound mountain passes.” I haven’t read Brown’s first book, Under a Flaming Sky, but reviews note that Brown also has a personal connection to that story; his great-grandfather was killed in the Great Hinckley Fire chronicled in the book. Therein lies a problem with Sarah as a character. She serves to help the reader imagine what it would be like to be a desperately frightened 21-year-old woman, stranded in the wilderness and trying to rescue her family, but she doesn’t come alive as an individual. We just don’t know enough about her, and Brown is too meticulous a nonfiction writer to invent personal characteristics. The book, he says in the introduction, is a “lens through which I hope you will be able to gaze with compassion and understanding on one young woman and all that the world once was to her.” By that measure, the book succeeds — but I found it disappointing not to know more about Sarah as an individual. It’s unfair to compare Sarah’s portrayal with that of Joe Rantz and the other “boys in the boat”, but it’s almost unavoidable. Sarah remains at a distance from the reader, while the 1936 Olympic crew team and their coach are people the reader comes to know intimately. One of my favorite aspects of The Indifferent Stars Above is the historical context that Brown provides. Often, he digresses from the Donner Party story, in a very engaging manner, to talk about nitty-gritty details of life in the 19th century. These asides give us a more rounded picture of the pioneers. They weren’t just “strong-jawed men circling the wagons to hold off Indian attacks and hard-edged women endlessly churning butter and peering out from under sunbonnet with eyes as cold and hard as river-worn stones”. Brown fills us in on common diseases of the time (the “Illinois shakes”), hygiene along the trail (minimal), birth control (not very effective), weapons (generally Revolutionary War-era), burial customs, attitudes toward children, and holiday traditions. Like the crew team, Sarah and the group of brave pioneers who set out on jimmy-rigged snowshoes across the Sierra Nevada to get help for their starving families were ordinary people trying to do their very best under difficult circumstances. Theirs was a life and death struggle, not a quest for an American gold medal, but the same theme runs through both books: character, hard work, and heroism. Some of the moral decisions the Donner Party made, including the decision to practice cannibalism, are open to debate. Readers who have the stomach for The Indifferent Stars Above will find themselves wondering what they would have done if they were trapped in the snow during that cold winter of 1846-47.